Home » News » COUNTDOWN TO THE REPLY CODE CHALLENGE 2019: JOIN US! Last year, the Reply Code Challenge competition inspired thousands of people. More than 7,700 contestants from 67 countries registered to join the first edition, and 6,000 threw their hats in the ring for October’s Cyber Security edition. The teams taking part in the Standard Code Challenge will use their coding skills to solve a tricky math’s problem. The winning team’s members will each receive an amazing Mac Book Pro. The Teen Edition Code Challenge – created in collaboration with the Italian Olympiads in Informatics Team – will challenge teams of up to four people to solve algorithmic problems. The winning team will receive €5,000 to be divided among the members. Sounds promising? To take part, sign up at challenges.reply.com from February 1st onwards, create a team, and participate on March 15th: both the Standard Challenge and the Teen Edition will be held online from 3:30 p.m. to 10:00 p.m. GMT. 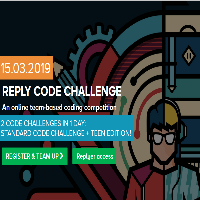 At 3:30 p.m. GMT, Reply will announce the challenges – and all teams can start developing and submitting their solutions on the Reply Code Challenge platform. You can find out more about the four-hour event at challenges.reply.com and in this video.